Do you love a good Twitter Party? You know we do, and we’re excited to host a party all about starting the year with a new breakfast routine. 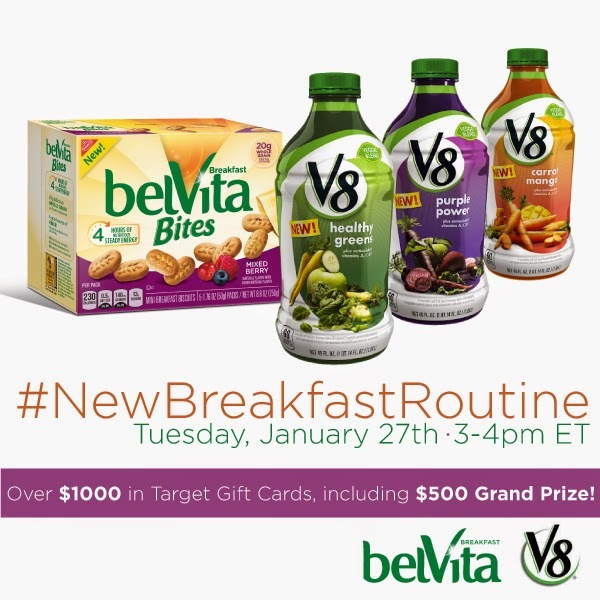 On January 27, 2015 at 3:00pm ET, please join us for the #NewBreakfastRoutine Twitter Party where we’ll be discussing the importance of having a good breakfast daily and how belVita Bites and V8 Veggie Blends make it easy to do so. Plus you'll have a chance to win prizes. How's your morning routine? If it's anything like mine, you might be out the door to start a busy day without having the time to get a good breakfast. Right? It happens to all of us. Then by mid-day I am so hungry that I stuff myself with extra fast food. That's no way to reach my goal of a healthier 2015. With our hectic schedules, it's so important to start each day off right. Join me for the #NewBreakfastRoutine Twitter Party so we can chat about the ways belVita Bites and V8 Veggie Blends can help you get a good breakfast so you can keep up with your busy days. Join me and RSVP for the #NewBreakfastRoutine Twitter Party on SoFab Chats! TIP: How to join a Twitter Party - sign in! Before party starts, click on the green “Sign In On Twitter” bar at the top of the page! TIP: Special deals and brand coupons? Keep that options checked when you RSVP for the party! TIP: New to Twitter parties? Watch your column and Party Team tweet columns - they are slower paced and easier to follow! TIIP: Where to find Twitter Parties? Check out the SoFabChats Twitter Party Calendar to find more fun parties to attend!